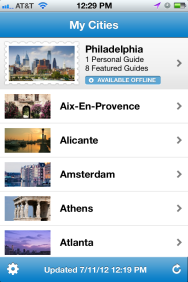 Stay.com offers guides to 120 cities, but its list view emphasizes your particular destinations. If it’s summertime, it’s vacation time. And these days, iOS users have little excuse for getting lost, or not knowing what their options are when they hit town. Among the tools for having that information at one’s fingertips is Stay.com which on Wednesday officially launched the latest version of its iPhone app. Stay.com’s app features guides to more than 120 cities around the world, helping users find their way around strange locations. 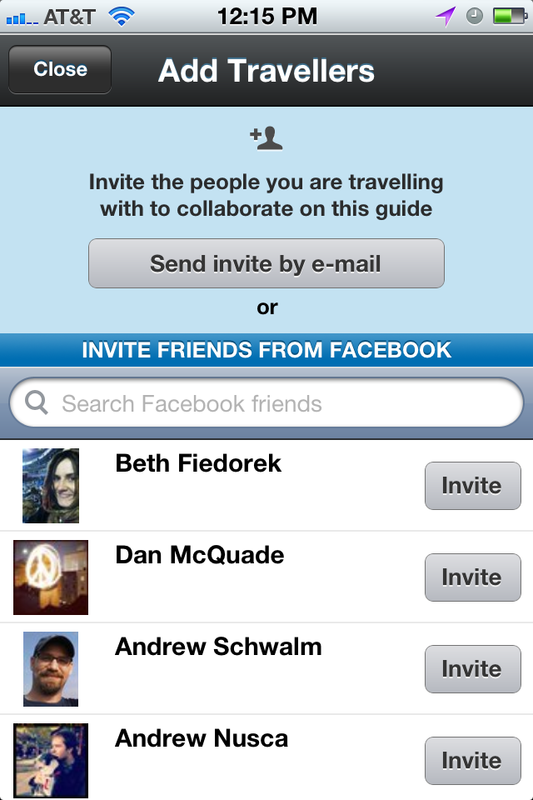 The update features Facebook integration that, in turn, offers users the new ability to collaborate with and solicit input from friends on crafting personalized itineraries. The result? A mix of both authoritative recommendations and crowdsourced wisdom. After downloading the app, the first thing you do is sign in. (Or not: There’s a “browsing” option, but you’ll want to sign in to use the majority of the app’s features.) There are two ways of doing this: Either with a Stay.com account—you can register directly from the app—or using your Facebook account. If you don’t have a Stay.com account, and you’re not worried about giving Facebook access to yet another part of your life, you might want to use the social networking service: The app is full of collaborative features that heavily utilize social networking. The core of the app is the aforementioned collection of guides to 120 cities, mostly in North America, but also featuring destinations in South America, Asia, and Europe. 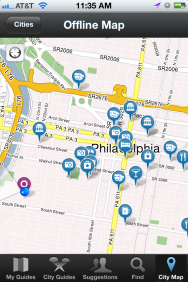 Maps are embedded everywhere in the app, and can be viewed offline. Tap on a city in the list, and it flies to the top of that queue, where it’s listed as one of “My Cities.” Tap again on that city, and you gain entrance to the guide itself. If the guide is helpful, you can download it at no charge for offline viewing, mitigating any problems you might have hitting your phone’s data service limits—but you can only use this feature if you’re signed into the app. The downloaded guides don’t take too much space on your phone; one city occupied 17 MB, the size of a few songs. To make matters more interesting, there are actually guides within guides. In Philadelphia, where I live, there are eight different such subguides for the city, ranging from recommendations for travelers on a budget to options for families. Tap on one of these and you can view the list of attractions—museums, restaurants, hotels, and more—and if you’ve been to one of the locations, you can rate it. (Note this: Stay.com lets you book hotel reservations from its website, but not this app.) 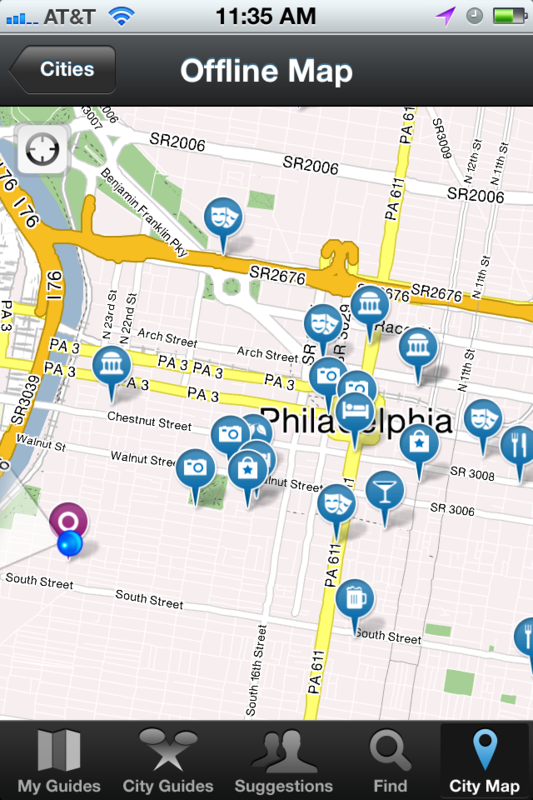 You can also search local highlights according to their popularity or their distance from your current location. Maps are embedded everywhere in the app. If you just want to see what’s around you, you can click on the map view, and recommended locations will pop up on the map around you. The list isn’t necessarily exhaustive, however: The app failed to note the presence of several popular restaurants in my neighborhood. There is a way to fix that, however: Make your own guide. The ability to construct your own guide is where the app’s integration with Facebook appears to be particularly useful. You can invite your friends to help you build a travel itinerary. You can do this informally, by soliciting your Facebook friends’ recommendations on places to stay, see, and eat in town—they don’t have to be Stay.com users to offer their highlights. (You can also designate other travelers who will be sharing the trip with you.) Or you can construct your own personalized guide, selecting locations that might not otherwise appear in the Stay.com guides (a friend’s apartment, perhaps, or a lesser-known restaurant) to create an agenda for your trip. 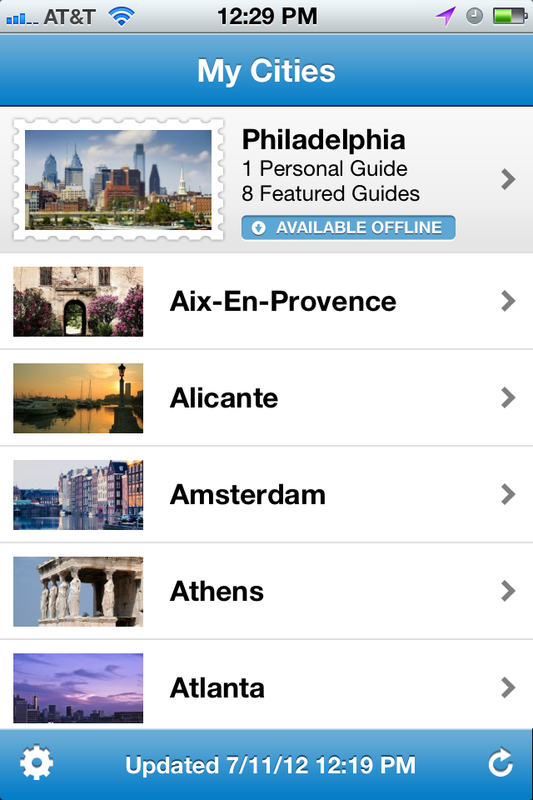 The app defaults to making the guides public for other Stay.com users to see, but that function can be turned off. 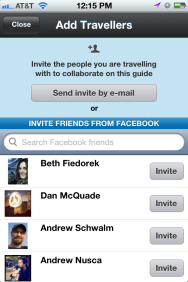 You can actively choose to share the guides with your own friends via Facebook, Twitter, or email. If you’re going even a little bit off the beaten path, this app may not be so useful: There’s no way to craft an itinerary or get an advance view of the sights in, say, Wichita. Stick to the world’s biggest cities, however, and there’s plenty here to use and add to. The Stay.com app is free, and compatible with most devices running iOS 5.0 or later.